We are engaged in offering a wide range of Angle Compression Cable Lugs, which is of superior quality. These cable lugs are efficient for swift passage of electrical cables and are used in numerous industry applications. The products offered in this range are known to provide sealing, stain relief and damage protection. Annual Turnover2011-12 Rs. 5-10 Crore Approx. 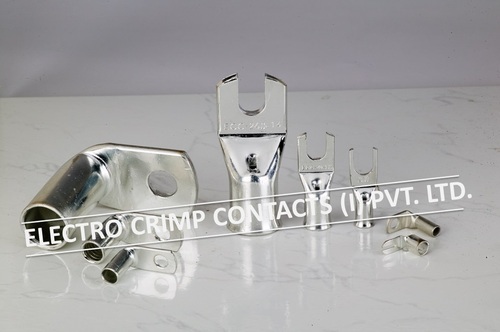 Incorporated in 1997, we, Electro Crimp Contacts India Pvt Ltd, are among the ISO 9001:2008 certified manufacturers, suppliers, traders, exporters and service provider of a wide gamut of Electrical Cable Accessories in the industry. Our product range is constituted of Cable Glands, Cable Lugs, Cable Terminal Ends, etc. We have gained prominence in the industry by providing offerings of unmatched quality and rendering our customers a delightful experience of conducting business with us. Our products are manufactured as per the established industry standards and are duly tested on several parameters to ensure that the desired standards of quality are maintained. These products are made available in both standard and customized options to meet the diverse requirements of the customers. By maintaining an inexorable focus on quality, we have been able to earn the commendation of numerous customers. Our clientele spreads far and wide and even transcends national borders. We strongly believe that a fine balance must be maintained between the maintenance of quality standards and optimization of costs, so as to provide perfect solution to the customers. We export our products globally.